No matter where you begin your BVI journey, follow the island itinerary below clockwise and you will find your origin at Nanny Cay. Trust us, these are our tried and true recommendations to make your trip absolutely unforgettable. After completing boat and chart briefings, check to make sure you have everything on board you need for your cruise. Stock up on any last minute provisions…don’t forget the ice! Take a mooring ball on the south side of the Bight where waters are the calmest which will be a perfect spot for your first night on charter. Pick up a National Park buoy and enjoy the wonders of the coral reef and its colorful inhabitants (don’t forget to look for treasure!). The Bight, Norman Island is rumored to be the site of Robert Louis Stevenson’s famous novel, ‘Treasure Island’. Plan to dine and drink at the “Pirates Bight” Restaurant ashore, which serves great food in a contemporary beach setting. If it’s peace and quiet you crave instead, tonight would make a great dinner aboard your boat pending you provisioned ahead for the meal. Norman Island makes for your first souvenir stop in the BVI at the Pirates Gift Shop, make sure you check the hours before you go as the shop is not open late. Be sure to check the restaurant’s event schedule as they often have live music you won’t want to miss. 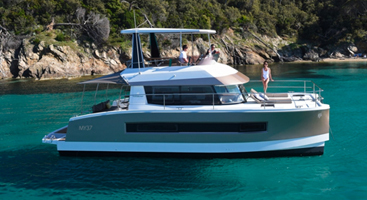 After enjoying morning coffee in the Bight as you watch your first sunrise from the flybridge of your charter yacht, head a short distance to the Indians where you can pick up a National Park Trust mooring buoy. The spectacular Indian Islands are considered to be some of the best snorkeling in the British Virgin Islands, especially since the hurricanes of 2017. 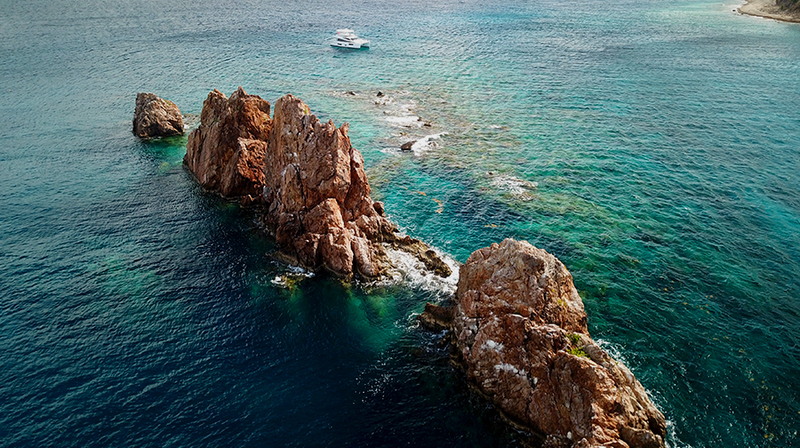 These tall rock formations, named for their resemblance to Indian headdresses, are home to an amazing marine life well worth the time to stop and snorkel. Get your underwater cameras ready…the Indians are brimming with beautiful coral and vibrant sea life. You might even get lucky and see a meandering sea turtle or two. Note: The seas here can sometimes be choppy which could be a challenge for some snorkelers. If that is the case, you might want to consider stopping at the Indians on Day 1 on the way to the Bight or the morning of Day 8 before heading back to Nanny Cay if the weather seems calm. Moor along the southern shore of Great Harbour for the night. Great Harbour is a deep, but well-protected bay with an easy, wide open approach. Navigation Tip: If no moorings are available at Great Harbour, the eastern shore or the southeastern side of the harbor have the best anchoring. 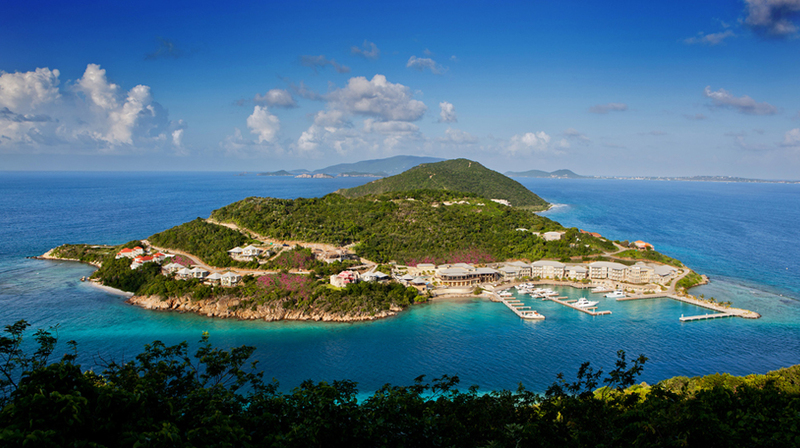 Note: Peter Island is also home to the world-renowned Peter Island Beach Club and Spa. Unfortunately, the resort suffered major damage during hurricane Irma and no further announcements have been made as to a when they will reopen. 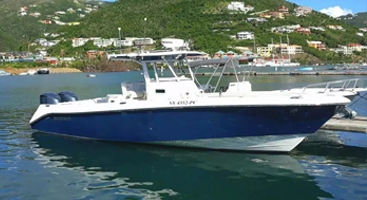 Great Harbour is the new home to the new and improved William Thornton Floating Bar and Restaurant… a must stop for most charter guests. Just keep in mind that this is a new location for the ‘Willy T’ and there are a limited number of mooring balls in the harbor. It is advisable to arrive by early afternoon if you plan on catching a mooring there for the night. If you are looking for the biggest party spot in the BVI, the Willy T is it! Note: It might be wise to avoid the Willy T on Sunday evenings. The locals tend to inundate the ship and the party can get out of hand. Dinghy to Little Harbour on Peter Island for a quiet afternoon of snorkeling and exploring. 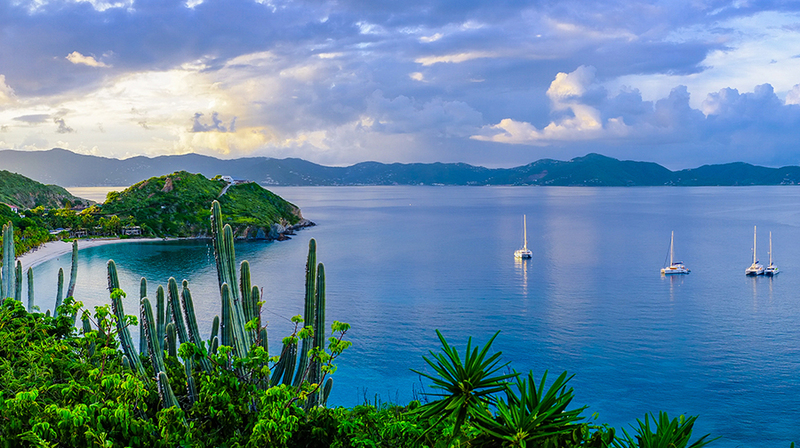 Little Harbour is one of the most picturesque anchorages in the British Virgin Islands. Note: It is also a protected night anchorage for those seeking a more private, quiet evening than that offered in Great Harbour. Dock your dinghy and go ashore exploring. There is an old abandoned customs house which is set in the brush just behind the beach area. You should find a trail that leads from the beach up to the house if it’s not too overgrown. Head back to Great Harbour for just a bit more snorkeling along the reef which attracts an abundance of marine life. There is also good snorkeling around the dock in front of the Oceans Seven Beach Club. For those looking for a more relaxed dining experience, Oceans Seven Beach Club, located on the west end of Great Harbour, is rumored to be reopening by late 2018. Not only does it offer wonderful seaside dining, but it is also a great location for family style watersports. From Cooper Island your divers and snorkelers can dingy over to the Wreck of the Rhone and Salt Island, depending on the weather. Note: We highly recommend upgrading to a RIB as this body of water can be choppy but it’s best to note the seas along the way. For more official dive accommodations, there is a Dive Shop on Cooper Island that can assist you. Navigational Tip: We don’t recommend mooring your yacht at the Rhone on most days. It’s very choppy and those staying aboard the yacht could have a rough time while you wait for divers. For snorkelers trying to get a glimpse of the wreck from the surface, we’d highly recommend snorkeling in the afternoon on sunny days. The sunlight helps snorkelers to see more of the Rhone from the surface. There is a dingy line at the Rhone located at the shallower part of the wreck. Salt Island just to the west is a deserted island but fun to explore. Things to look for…check out the salt ponds and the memorial wall commemorating the sailors of the Rhone in the cemetery. It’s also a great place for a hike around the island for those itching to walk. Note: We highly recommend having sneakers to go ashore here. The terrain is a bit rough and there is quite a bit of sea glass. After a full morning of exploring, relax on the sandy, white beach of the Cooper Island Beach Club where you’ll also find a newly expanded Rum Bar, Microbrewery, Boutique, and Gourmet Coffee Shop. Be sure to make dinner reservations at the Beach Club’s exquisite restaurant for sunset….the most romantic time to enjoy their Caribbean cuisine. Note: Reservations are recommended year round but are essential in peak season. No anchoring is allowed at the baths so we’d recommend picking up a day-only mooring ball at the north side of the Devil’s Bay. Note: The closer you can moor to the shore, the calmer the water will be. Take your dinghy into shore to explore the magnificent boulders of The Baths. There is a dingy line to secure your dingy offshore and a swim line for any of your guests that need help getting to shore. Natural pools and cave-like formations with gleaming natural light that seem to go on for miles, welcome you and your guests ashore. Make sure to take a camera as there are excellent photo opportunities for your group. Have an early lunch at the Burger Shack on the beach before it gets too hot…and too crowded! You’ll certainly want to buy souvenirs T-shirts here at the Baths, but make sure you have a wet bag as the only way back to the dingy is to swim. Note: The T-shirt shop at the top of the Bath is the best in the BVI but it’s a long hike up the trail…you might want to come back later by car for that one. While your guests are finishing up lunch and shopping, one or two of you can weave back through the trails to Devil’s Bay to grab the dinghy. Pick everyone else up at the end of the swim line at the Baths. It will save them having to make their way back through the entire trail. Leverick Bay Resort is a full-service marina with an option to anchor, moor or dock. We recommend docking so you can take full advantage of this provisioning opportunity. Services include ice, water, fuel, showers, electricity, trash disposal, and laundry. Relax around Leverick Bay Marina’s 50′ freshwater pool while indulging in the fine foods and beverages available at the Jumbies Beach Bar. It’s a perfect way to meet friends! Once ashore you can take advantage of all of the amenities that Leverick Bay has to offer, but certainly, plan on a relaxing dinner at their upstairs restaurant overlooking the North Sound while you think about your next day’s activities. Leverick Bay hosts a wonderful watersports recreation center where you can rent sunfish, small sailboats or kayaks, experience flyboarding, or catch a ride on a jet ski. They even have towable rentals in case you forgot to provision them for your charter. Spend the day on the water! 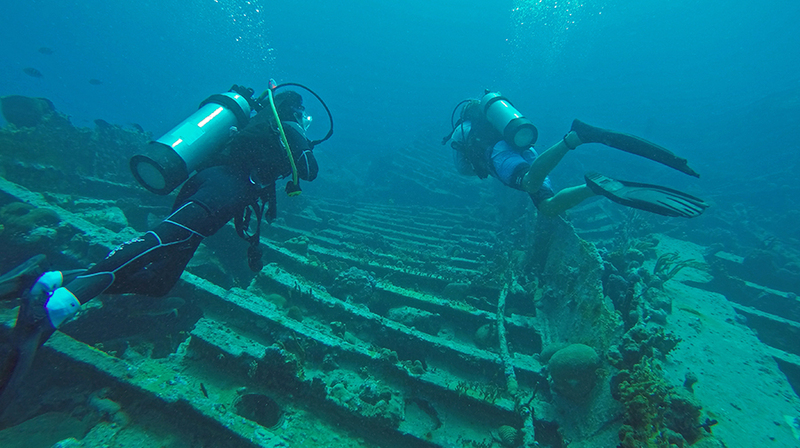 Contact the BVI Snuba and set up an excursion for the whole family. This amazing underwater adventure is a cross between scuba diving and snorkeling but requires no previous certification or experience. Just a comfort in water with basic swimming skills is all that you need for a day of fun! For the fishing enthusiasts aboard, Leverick Bay marina provides services that can arrange a fishing tour for the day. The North Sound lies just 15 miles south of the east Anegada drop, considered to be a prime fishing spot in the Caribbean. And don’t worry. If you land that big tuna you have always wanted to catch, they even have facilities for cleaning your fish. Not only that but they will even cook it for you! Pamper your guests with a day at the spa! Enjoy a variety of treatments ranging from massage and facials to nails and hair services. A great way to enjoy the luxurious side of the BVI! Their professional therapists are even available for onboard services. Contact the spa for reservations and availability. Take the dinghy towards Oil Nut Bay on the northeast tip of Virgin Gorda and snorkel “The Guns” in the Eustatia Sound on the east side of Deep Bay. There you’ll find old cannons covered in coral reef just a few feet below the surface of the water. Note: Statia is a private island so landing ashore is not encouraged. From Leverick Bay venture west by dinghy and snorkel Anguilla Point just south of Mosquito Island or Mountain Point further to the west. 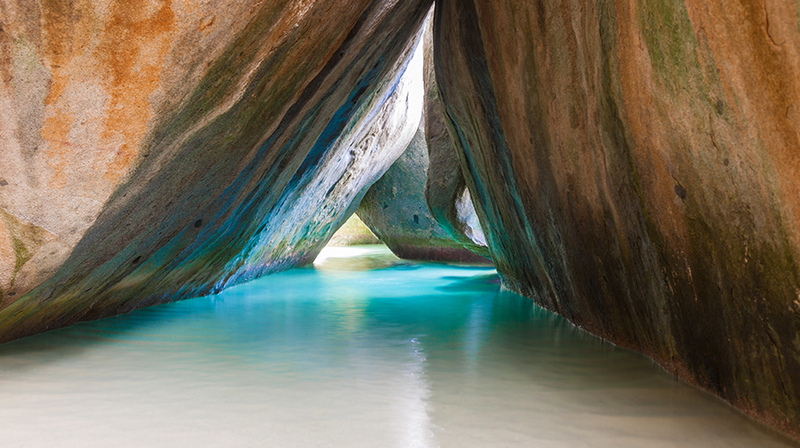 Spend the day exploring the island of Virgin Gorda. Gorda Peak reaches 1368 ft above sea level. 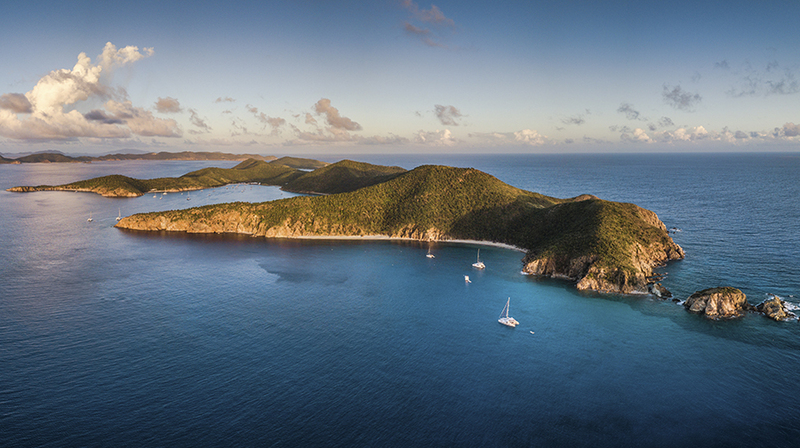 There you’ll find spectacular 360-degree views all of the BVI. 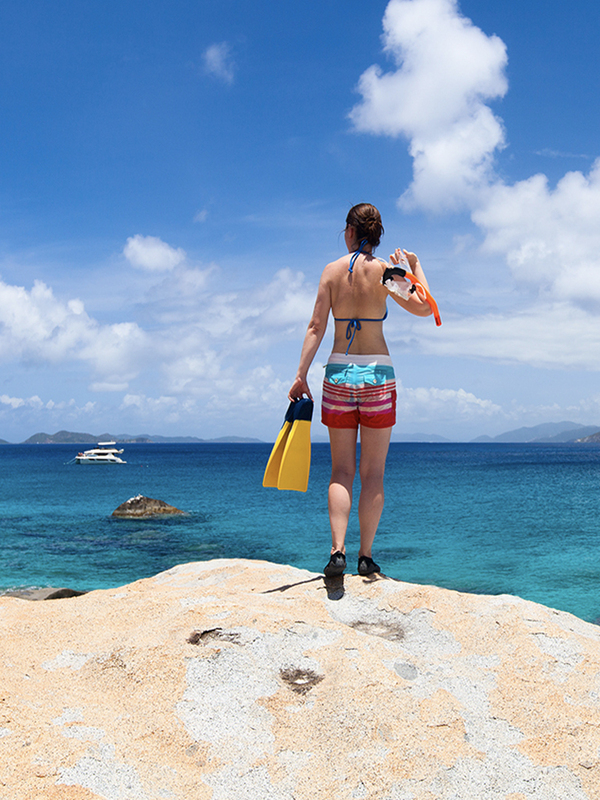 If you haven’t tired of snorkeling Virgin Gorda has many shallow water spots to explore coral and marine life on the back side of the island….Mahoe or Savanah Bay are two excellent choices. Perched 900 feet above the North Sound, the view is breathtaking and the food is delicious. If your charter plans bring you to Leverick Bay on a Friday evening, you and your guests are in for a special treat. Leverick Bay hosts Friday night Jumbies parties complete with an all you can eat Beach BBQ and Moko Jumbie Dancers & Entertainment. What fun! Enjoy the “Michael Bean Pirate Show” every Monday, Tuesday and Wednesday evening. Clean and fun for all ages. Bring the family and your best pirate costume! Moor at the southwest corner of George Dog close to Kitchen Point. There aren’t many moorings there so hopefully, you won’t have to wait for one. The snorkeling is excellent near Kitchen Point at the southwest corner of George Dog. If the seas are not too choppy, you can also swim around the point to the east shore of the island where you’ll find beautiful coral formations. There is also good snorkeling at The Chimney located at the north corner of the bay on the west side of Great Dog. You’ll also find several National Park moorings at this location. Navigational Tip: If there are no moorings available at the Dogs, on calm days the best anchorages are the bay to the west of Kitchen Point on George Dog as well as to the south side of Great Dog. Moor at Marina Cay. There are plenty of mooring balls available for day or overnight accommodations. After mooring, dinghy into the dock at Marina Cay. The shallow waters and surrounding lagoon are a perfect setting to enjoy a peaceful afternoon on the beach. 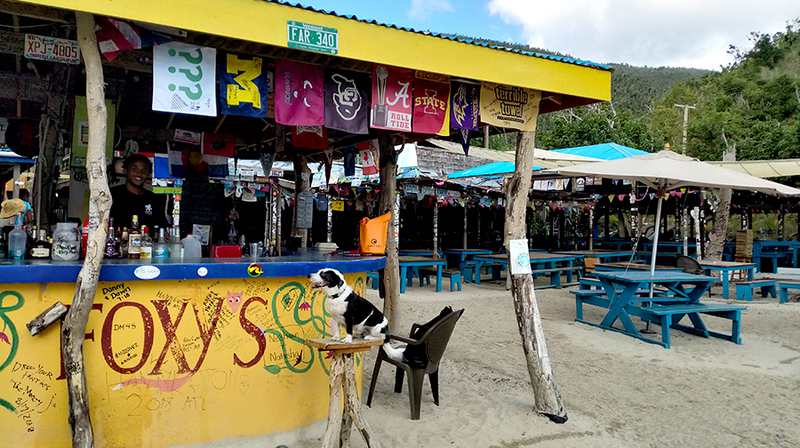 After a morning of snorkeling, lunch at the award-winning Pussers on Marina Cay. They have a new outdoor dining area with relaxing views of the lagoon. For guests looking for a spot to enjoy snorkeling or diving in calm waters, this is the perfect spot. The coral reef of the lagoon attracts colorful marine life that makes for excellent snorkeling. Treat yourself to a beautiful evening at Scrub Island. Stay on the docks overnight and you will get access to all the amenities – beautiful shower facilities, a HUGE two-tiered infinity edge swimming pool – complete with waterslide and swim-up bar, a hot tub and multiple wonderful restaurants. Be sure to walk the docks at night to see all the Tarpin in the blue lights of the boats. 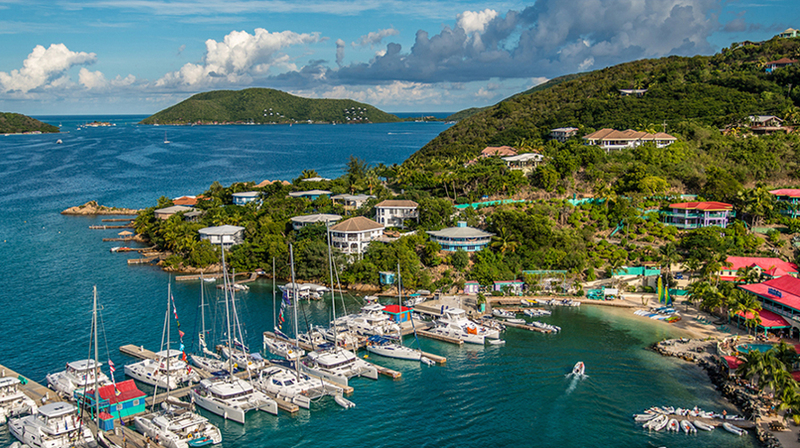 Note: Scrub Island Marina charges $1.50 – $2.50 per linear foot plus 20% resort fee for overnight docking. Rates are higher during Christmas holiday season. If you choose to stay overnight on your mooring at Marina Cay, dinghy to Scrub Island for an amazing 5-star dining experience at Caravela Restaurant. Check out a sample of their menu. Note: Most resort amenities are reserved for marina guests. The restaurants and spa are open to everyone. Cruise down the rugged and unspoiled North shore of Tortola and spend the morning exploring Sandy Spit and Green Cay just off the northeast point of Jost Van Dyke. Note: Care must be taken if attempting to dinghy into shore at Sandy Spit if there is a strong north swell. Although this deserted island beach is an awesome place to relax, it can be quite difficult to attempt this if the weather is not cooperating. These deserted little islets are a perfect spot to snorkel the underwater coral bridge in their shallow waters and just enjoy the peace and serenity of their natural Caribbean habitat. By midday, head over to Great Harbour and pick up a mooring for the night. Dinghy west around the western tip of Great Harbour into White bay. Note: There are day moorings at White Bay but we don’t recommend their use by our charter guests as the water is extremely shallow in many areas of the bay. Dock your dinghy on the beach at the Soggy Dollar Bar and enjoy one of their perfect ‘painkillers’ originated and perfected there back in the 1970’s. Note: Check the drink board when you arrive. You might have a cocktail already waiting for you thanks to someone you know who knew you coming. Catch lunch at Ivan’s, also in White Bay. It’s not quite as crowded as Soggy Dollar Bar up the beach and the atmosphere is very laid back and relaxing. It’s a good place to meet people from all over the world who come there to camp. Bring your snorkel gear and snorkel off the beach at White Bay towards the western tip of the island. This undersea coral formations here are home to stingrays, tarpon and even turtles making for an amazing snorkel experience. This may be one of your last chances to snorkel and well worth it! Note: Give yourself enough time to get back to Great Harbour while it’s still light. That’s a dinghy trip you wouldn’t want to make in the dark. No charter would be complete without making a stop at the world famous Foxy’s Bar and Restaurant. If you stay for dinner, Foxy often will make an appearance to entertain his guests…a memorable experience for sure! For the partiers onboard, Foxy’s is also known for their late night parties and live music. Their Halloween and New Year’s Eve celebrations draw people in from all over the world. You won’t want to come back from this charter without a t-shirt or hat from Foxy’s. That name is recognized all over the world. For years to come, people will stop you when you are wearing that shirt to ask about your trip! Corsairs in Great Harbour is another nice option for dinner or perhaps a nightcap. If not, they are open for breakfast as well so plan on rising early before heading out the next day. Pick up a mooring ball in Cane Garden Bay, your last stop before heading back to the dock at Nanny Cay. There is plenty of moorings available here so you shouldn’t have any trouble catching one for a few hours. Navigational Tip: There are two well-marked reefs as you enter Cane Garden Bay. Just stay between the buoys and you won’t have any issues. There is a long dinghy dock onshore to the left as you look at the beach from your mooring. Still need to find that special gift for family back home? Spend the morning souvenir shopping at some of the great little boutiques in Cane Garden Bay. It is also home to Green VI Glass Studio where you can watch glass blowing artisans create hand-crafted pieces from the local recycled glass. 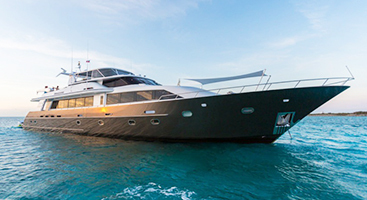 Depart Cane Garden Bay with enough time to arrive at Virgin Charter Yachts no later than noon. It's 10 nautical miles from Cane Garden Bay to Nanny Cay which will take you approximately 40 minutes at 15 knots. Make sure to give yourself ample time to refuel and complete the check-in procedure at our dock before rushing to catch your Ferry or Flight if you will be leaving Tortola that day. 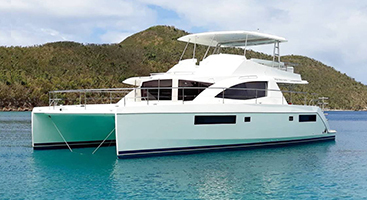 Even if this was your first charter in the BVI, I'm sure you can now see why it's such an amazing destination for charter vacations. After your first week in the BVI, you've only just scratched the surface of the things to do and places to experience here. As you watch the sunset on your last day in the British Virgin Islands, make a promise to yourself to be back soon and charter again with Virgin Charter Yachts!